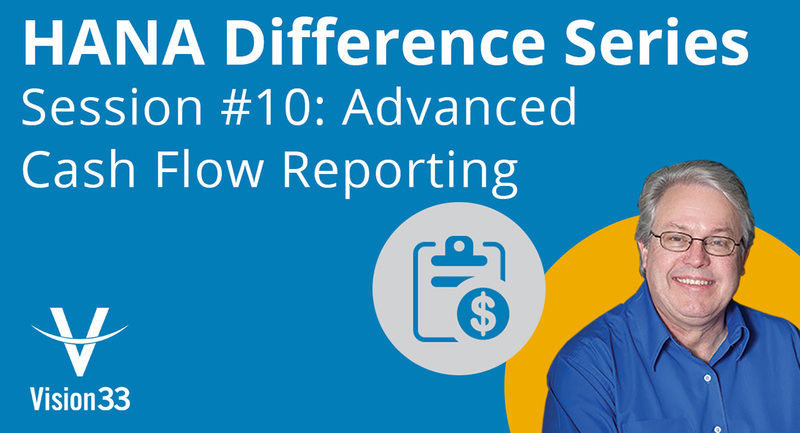 Continuing the SAP Business One version for SAP HANA Difference series we look at the Advanced Cash Flow Report. SAP Business One, version for SAP HANA provides a cash flow forecast function to let you view detailed information about your company's incoming and outgoing cash flows. 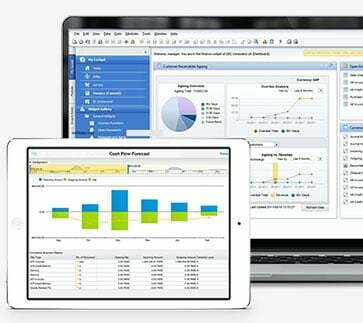 You can access the feature from the ‘Cash Flow Forecast’ icon in the top right corner of the SAP HANA menu bar. In SAP HANA, this feature has been extensively improved from the standard version of SAP Business One running on Microsoft SQL server version. The feature will select today’s date and 6 months automatically. If you click on the Configuration drop down it will prompt several options about measurement. By default, it will use outgoing cash and transactions, as well as incoming cash and transactions among other options. Users can toggle these check boxes based on their needs and thereby tailor the cash flow report in real-time. Under the configuration, users will also find criteria which enables the user to include recurring postings and transactions, blanket agreements and more. Users can also specify a certainty level within the Cash Flow Forecast. By clicking the wrench icon, users will be presented with certainty levels 1,2,3, etc. where you can assign things like A/P down payments, and A/R down payments, among others. This allows you set the security and reliability of these variables depending on your business. You can drag and drop each of these variables using the mouse in real-time as well. Certainty level 1 represents the most secure and reliable, while certainty level 8 is the least. Note that you will have to set these certainly levels up each time you run the ‘Cash Flow Forecast’ report. Once you have configured the certainty levels, SAP HANA will recalculate your report in real-time. The certainty slider on the ‘Cash Flow Forecast’ report screen acts like a dimmer – you can slide it left and right to exclude or include variables that have previously assigned certainty levels. You can define the reference period for incoming and outgoing activity using the month slider as well. Based on how much time you cover for the cash flow, SAP HANA will automatically recalculate the forecast for a corresponding duration. Meaning, if you’re analyzing weeks, then you’ll see a forecast of weeks, if you analyze several months’ worth of data, then you’ll get several months of forecasting. The last section of the report that users should familiarize themselves with is the ‘Considered Business Objects’ table at the bottom of the cash flow forecast. You can scroll through all the document types that are included in the report and the amounts. It divides them by document type, the opening balance, incoming amount, outgoing amount, and the certainty level. You can further click on the arrows next to each of the items in the list. For instance, if you clicked on sales orders and you had ‘8’ referenced in the ‘Cash Flow Forecast’, you would then see the list of the sales orders. You can click on the and see them in detail. Users can get a similar result by clicking on the forecast, only they will drill down into all the documents for the specific time period for the range selected. This ability to drill down into data in real-time is one of the key reasons why SAP HANA is so powerful. This addition in SAP Business One version for SAP HANA is much more graphical approach to what-if cash flow forecasting. It allows users to divide and concur. You could take out a variable like the outgoing balance and instantly see what the affect is on the graphic and the report, so you can refine the report to look at expense only for example. SAP Business One version for SAP HANA also gives users the ability to further export their data once a report has compiled the results for even more analysis. In the case of the ‘Cash Flow Forecast’, users simply need to click the ‘Export’ button in the bottom right corner of the report when they are finished configuration and defining a time frame. For a more in-depth look at advanced cash flow forecast in SAP Business One version for SAP HANA, watch the recent Vision33 TOTAL Care Wednesday Webchat hosted by Vision33’s SAP Business One Ambassador Carl Lewis.